Sloppy joes are a kid-friendly meal. Add finely shredded vegetables to the beef and you'll be boosting the nutrition of this crowd favorite! I went through a long stretch of adulthood without eating sloppy joes. All Lunch Lady joking aside, I have no idea why that was. I like my joes. That long stretch was finally broken one lunchtime when a bunch of moms gathered with their kids at my friend Miho's house. She served a big pot of sloppy joes and all of a sudden I remembered loving them as a kid. My kids tried them for the first time and thought they were pretty tasty. I started making them for my family, and I'm pleased I can stretch a pound of ground meat into multiple meals. When I signed up to bring lunch at the thrift shop, I wanted to make something that would appeal to a variety of meat eaters (I knew there were no vegetarians that day). I also wanted something with veggies, and something that could sit in a crock pot unattended all morning while I was busy out front. Very Veggie Sloppy Joes fit the bill. I fixed this the afternoon before and brought my crock pot and rice cooker in to the store to provide everyone with options*. *I am all about the options, I realize. Even the composting pigs get a choice of sleeping compartment each night when we put the Pigloo, the Woodland Hideaway, and the SnackShack into their cage. Two pigs, three bedrooms. Back to the topic at hand. 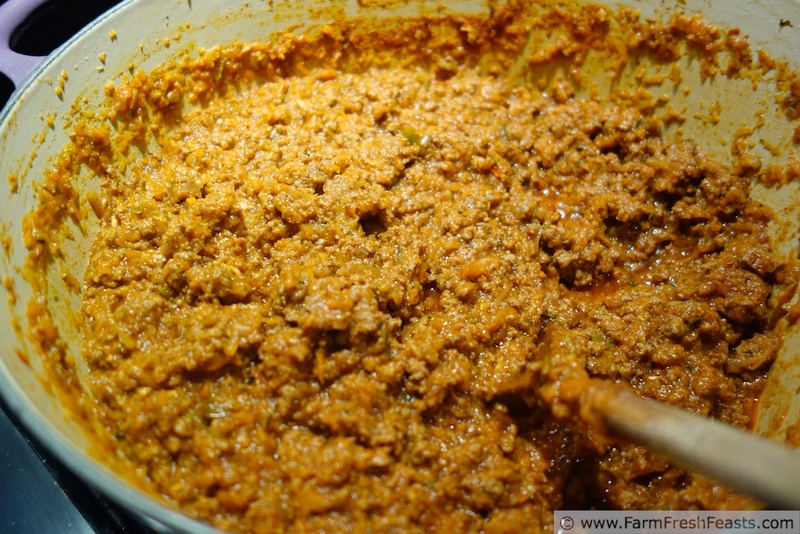 My friend Cathy mentioned that her family enjoys the Pioneer Woman's sloppy joe recipe, so I used that as a jumping off point for this recipe, but added more veggies since I've put them up from my CSA farm share. We like our first round of joes on buns, with a slice of cheese and a squirt of yellow mustard. The leftovers get served over rice, with an optional cheese slice sandwiched between the joe and the rice. My kids enjoy this in a thermos at school, or come home for lunch and eat it here. In a pretty purple pot over medium heat, brown the ground beef. Drain the fat from the meat and set the meat aside (I frequently dump the meat in the upturned lid of my pot, since it's just hanging out anyway and sure is big enough). Return the pot over medium heat (I don't need to type preheat, right, since the pot is already warm?) and sauté the veggies for 8-10 minutes until softened and starting to brown. Since my veggies are all approximately the same size, I just dumped them all in the pot together. Add back in the meat, stir to combine, then add in the rest of the seasonings. Simmer over medium heat for 30 minutes to an hour. Serve as described above, or your favorite way. Once cooked, this can hang out in a crock pot on low at least 4 hours. This post is shared with the Clever Chicks Blog Hop at The Chicken Chick, the Wednesday Fresh Foods Link Up, What's Cookin' Wednesday, What's In The Box, and the From The Farm Blog Hop. A perfect lunch--leftover joes, over rice, with cheese, mustard, and a glass of milk on the side. Yes! 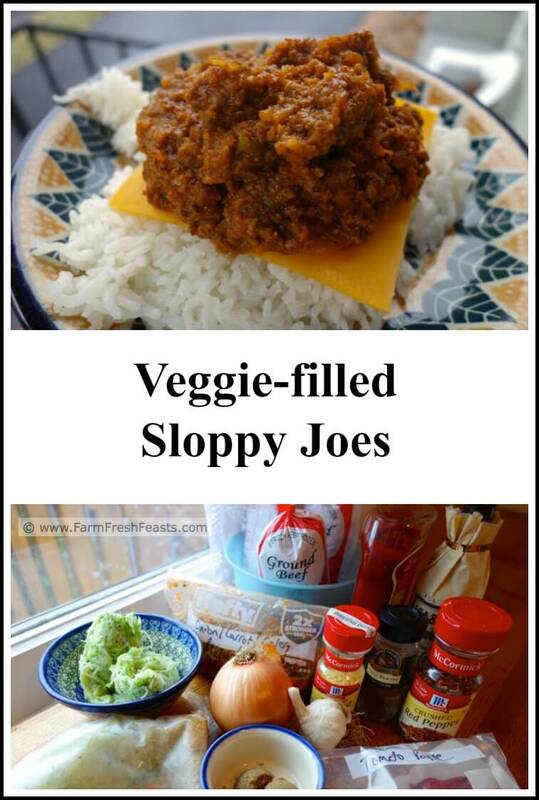 I love sloppy joes, and all the better if they have a healthy dose of veggies! My son eats beef now – yay! – so these may be on the menu soon. Thanks for the recipe! I'm always glad when my formerly picky kid will eat something new. I take that back--I am not glad when I have to share the Indian leftovers because the formerly picky kids now love Indian food. 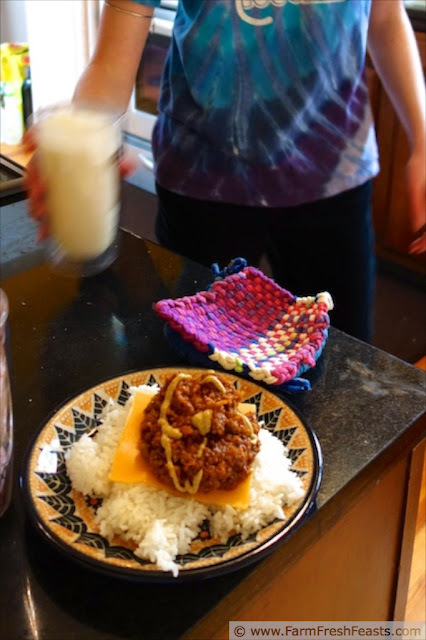 We always put our chili on a bed of rice. I wonder why we never thought to do the same with joes. Very clever of you. I love bringing big crock pots full of food to large gatherings. It's so easy and convenient. The pigs are adorable. Do they ever sleep in the same house together? Very clever of my friend Miho--she taught me how to freeze and store leftover rice, too. Clever woman. The pigs sleep together when we are on the road with them, and they are crammed into a cage big enough for only 1 "bedroom". I have no idea how long they've been together--they were given to the rescue organization as a bonded pair, and Quartz may or may not be the dad of Crystal. Now there is a recipe I'll have to try, it looks so good........Thank you for sharing with the Clever Chicks Blog Hop this week; I hope you’ll join us again! 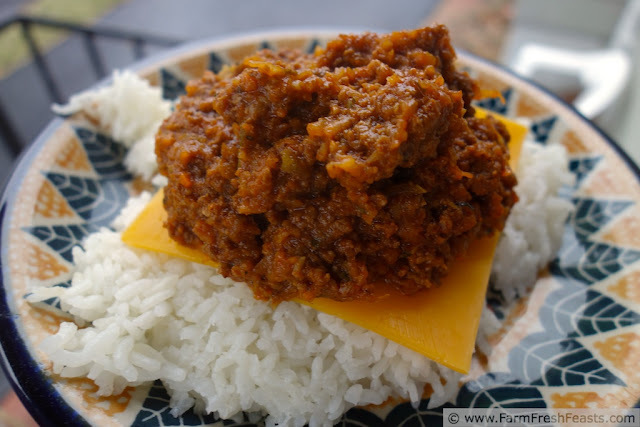 I've never had a Sloppy Joe but I like the idea of eating it on rice. 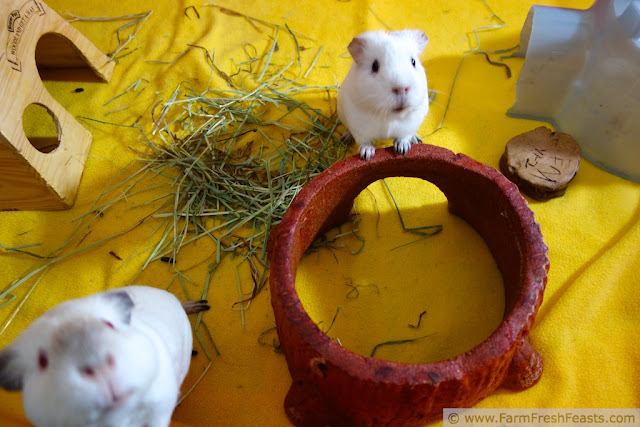 Love the expressions on your guineas. I would not have expected the composting pigs to be so . . . full of character. As a kid I had hamsters, and they were not as interesting pets as these pigs are. That is a very pretty purple pot! And those very veggie sloppy joes sound like the perfect crowd pleaser. Rarely do I choose something for the kitchen that is form over function, but I think I scored with this pot (and on sale w/ coupon, too, can't beat that) getting both function and form. "I am correctly remembering "Barbecue" as the common name for Sloppy Joes in NW Minn in the mid-'50s. 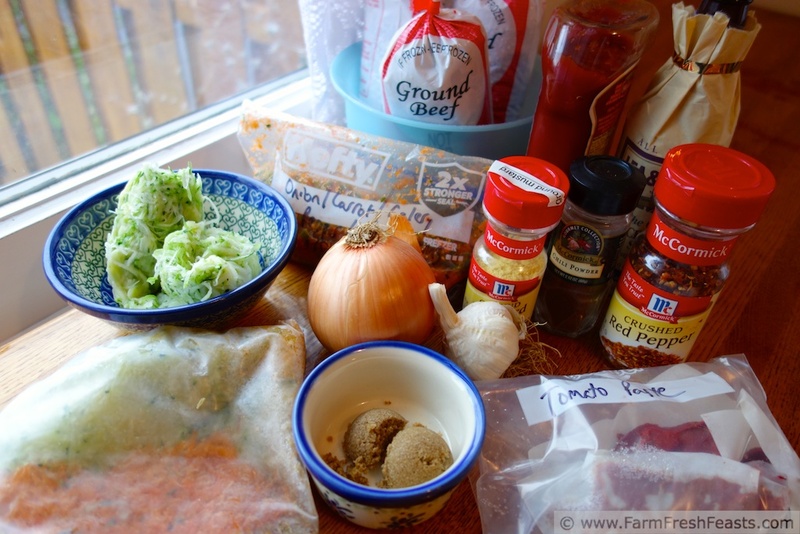 My memory of the ingredients: hamburger, chopped onions, rice as binder put in raw, bottle of ketchup, water, spices [cloves, sugar, celery salt/seed, maybe others] that you could buy in supermarket as a regional spice/seasoning. I am certain of the cloves and sugar. Maybe the 4-H leaders who made the thing I usually ate were the ones who "stretched" a little w/ the rice, and restaurants did not; do not know. But the mixture held together well. When Campbell's got into the act, they started w/ only a couple of their soups, and your Grandmother/Mormor took to it w/ gusto. The one w/ French Onion esp; the one w/ Chix Gumbo also. But in the HB Camp cookbook, the wholesale use of all Campbell's soups became their strategy. The "new" idea -- one flavor -- would be in an ad in a women's mag, to introduce. Just like Betty Crocker's campaign to make quiche w/ Bisquik called Impossible Pie. But I bought a big glass pie plate to make it at the beach. I think "Can't Believe..." was in the marketing campaign."